Obe Carrion’s latest addition to the Madrock line, The Pulse, is a solid step in the right direction for the future of climbing shoes. For starters, the concept of Positive and Negative (i.e., wide and narrow) sizing, in lieu of gender stereotyped male and female models is revolutionary. Who hasn’t tried on and preferred an opposite gender shoe before? The notion that men have manly wide feet and women have dainty narrow feet is not only inaccurate, but it reinforces oppressive cultural stereotypes that force people into boxes they don’t actually fit into. In a sport as egalitarian as climbing (can anybody name another sport where the gap between top performers in each gender is as tiny? ), this is a long awaited nod to gender equality. I recently tried out the Pulse Positive, and was super psyched on it. When I took it out of the box, I immediately thought of La Sportiva’s Miura – considered a high-end shoe for trad, sport, and bouldering. I was amazed to find out shortly after that the Pulse was actually created as an entry level shoe! After wearing the shoes for a few days while setting problems for the first citizen’s comp at New York’s The Rock Club gym, I was an instant convert. The fit is glovelike, and the material breathes like a lung (which is great because my feet sweat like a swamp). 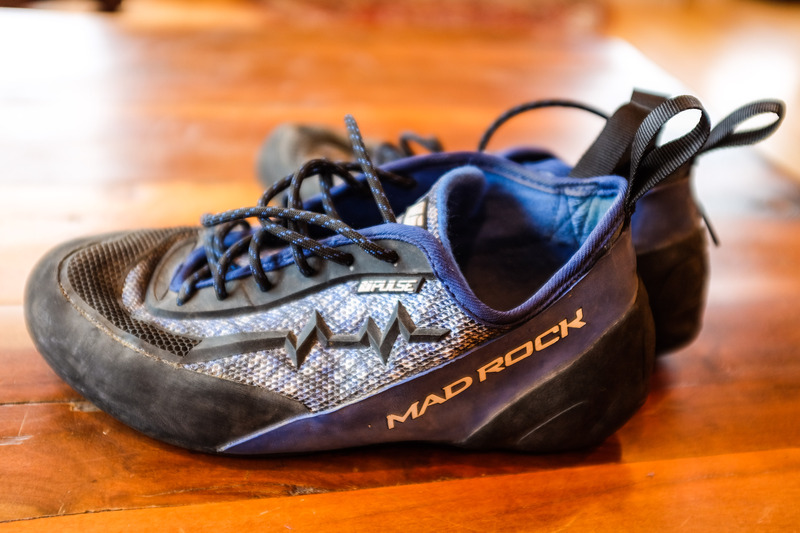 It performed equally well on slab, vertical, and gently overhanging terrain, and I found myself grabbing for these instead of other more expensive kicks I have even on my hardest routes. They simply feel good on your foot. The next stop for the Pulse Positive was Shelf Road in Colorado. Shelf is kind of a unique location in that it is bolted limestone face and crack climbing. I found myself heel-toeing wide crack, rand-smearing on ringlocks, jamming, edging, and frontpointing on some tiny slippery limestone pockets and crimps. 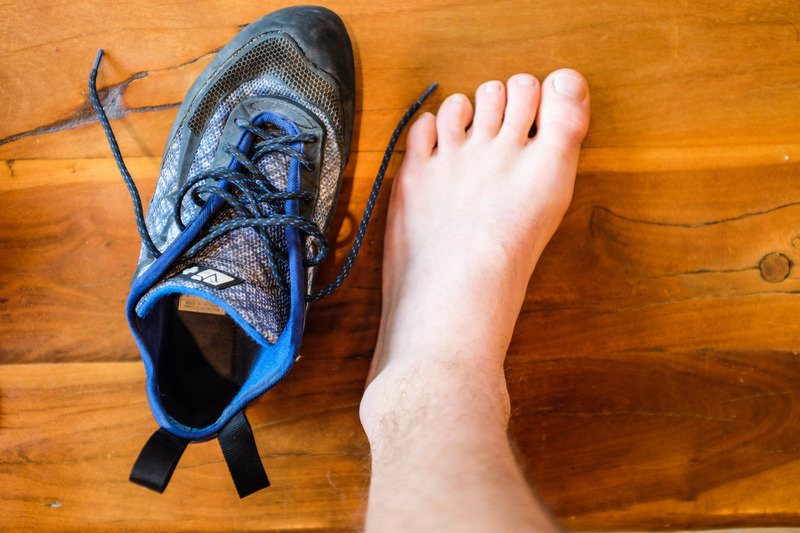 I was climbing with only the Pulse, and the shoe felt both comfortable enough to wear while belaying, and precise enough to onsight at my limit. They performed best on dead vertical terrain, on microedges and in thin cracks. While they left a little bit to be desired in toe and heel-hooking, I found that to be only a small ding on an otherwise excellent shoe. This may not be the shoe of choice if you climb predominantly on terrain steeper than 30 degrees; but keep in mind, that wasn’t Obe’s (or Madrock’s) intention. What Obe was really going for here is a shoe that could introduce new climbers to the sport without browbeating them with the typical shirtsoff-beaniewearing-burlymuscled machismo or tippytoed-pinkbotyshorty-ohsodainty femininity that mainstream climbing simply reeks of. At the same time, he wanted to make a high performer that climbers could stick with as they progress, whereas typical beginners eschew their entry level shoes after about 6 months for something more advanced. I’d say Obe and Madrock scored big on both sides here. For the price, I haven’t seen another model that can compare. Thanks a lot, Madrock, for hooking it up with the new shoes! Be sure to keep an eye out for the Pulse Positive and Negative in climbing shops everywhere in the near future. I wasn’t a huge fan of the madrocks I owned in the past, but it looks like the company is really doing great things for the entry level market. I hope more companies follow suit; I’d love to have non-floral/pastel/pink options in footwear that runs in my size. Don’t take this as a slam, normally I really enjoy reading what you write and agree most of it. But some of what you wrote just isn’t true. My point is that their are differences between men’s and women’s feet. So it makes sense to make shoes designed for mens feet and those designed for womens feet. It will be revolutionary when a shoe company makes additional subcategories of shoes for people who differ from the average. For example, I am a mens 10 wide. I haven’t found this in a climbing shoe and that is frustrating. I’d bet money that their are men who would fit better into a mens 10 narrow, if it was made than into a womens shoe, relabeled as “narrow”. Simply relabeling the same two molds we already have and using bland/neutral colors isn’t progress. We have the technology to analyze foot structure and design a better shoe for people with non-average shaped feet. When they start selling those I’ll be impressed. i bought a pair of these in a comfortable size and they blew me away!! my heel was snug the whole time and the fit is amazing. the only thing i would change is the lack of curve @ the toe. if this shoe had a bit more of an aggressive curve (just a little bit like the 5.10 Anasazi) they would be the perfect shoe! 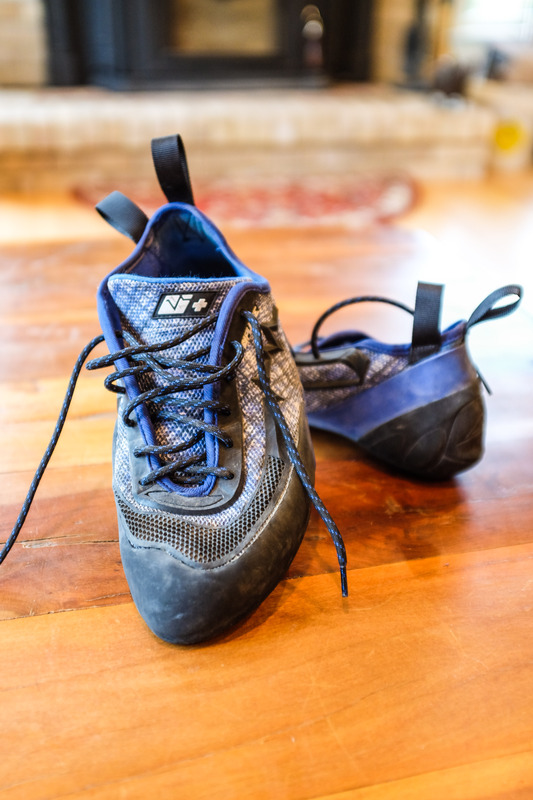 these shoes are amazing, i have been climbing for 10 years and i know this shoe is marketed for the beginner, but this IS a performance shoe and i cant wait to jam them in some cracks!!! !